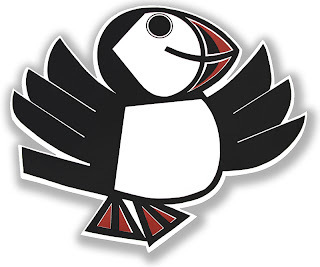 I can’t tell you the year this handsome chap appeared – but he is one of the early exhibition flyer puffins that decorated a Puffin Club Exhibition. There have been quite a few that Jill McDonald designed over the years with a kind of evolution that becomes easier and more stylised with every passing event and exhibition. It makes me wonder what she would have produced if she hadn’t died at such an early age. Something marvelous! Thanks Ruth! It was a challenge. I hope to bring a few more of your gems back to full glory.